Alien: Covenant was poised to be one of the biggest hits of the year, but ultimately wound up being a big disappointment at the box office. And, at very best, it was divisive among fans and critics. Given the reaction to Prometheus, Ridley Scott ultimately decided to lean more heavily on the Xenomorph and its origins in Alien: Covenant. 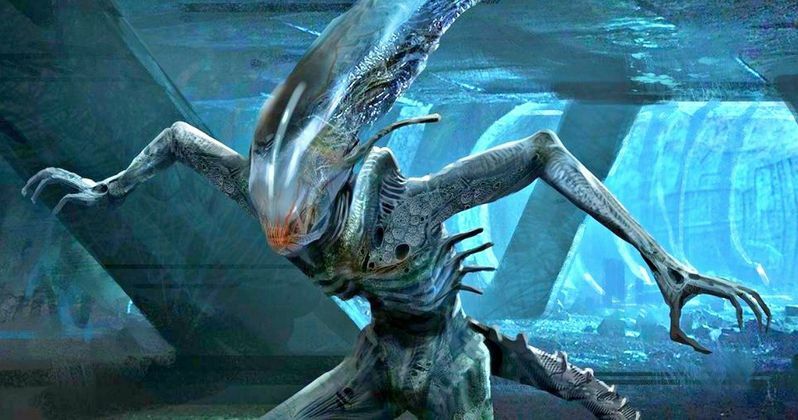 However, at one point, the movie was going by Prometheus 2 and, thanks to some newly revealed concept art, we see that it would have been a much different movie had that version gone forward. The art comes from an artist named Khang Le. As pointed out by the fan site AvP Galaxy, "Though he doesn't appear to be credited on the film, we have confirmed that Khang did work in Covenant's art department back in 2014." The art for what would have been Prometheus 2 was on Le's personal website, which has been down for a handful of days. There are more than 30 images to look at, depicting a concept much more heavy on the Engineers. In the entire batch of images, there's not a single, fully-formed Xenomorph. In Alien: Covenant, the plot hinged on Michael Fassbender's David being stuck on a planet for years since the events of Prometheus and engineering the Xenomorphs himself. Based on this concept art, it looks like Ridley Scott would have followed a path that sees the Engineers ultimately become the Xenomorphs. David is still featured in a piece of this art, but he doesn't appear to be the architect of the famed creature as he ultimately became in the Alien prequel we got. Prometheus 2 looks like it would have leaned very heavily into the first movie and relied a lot less on the iconic imagery of the Alien franchise. It's hard to say if this would have been a better decision at the end of the day. Prometheus grossed $403.4 million at the box office. That's a whole lot better than Alien: Covenant's $240.7 million. Then again, is the lackluster reception to Prometheus among fans of the franchise to blame for the hit that Covenant took? It's possible. Would Prometheus 2 have been able to overcome that lackluster reception without the Xenomorph? It really is hard to say, but this concept art is fascinating in hindsight. It wasn't until September of 2015 that Prometheus 2 became Alien: Paradise Lost, which then became Alien: Covenant. So this concept depicted in these images was scrapped quite some time ago. Given where the Alien franchise is at now, which may be completely dead, as Fox is said to be holding off on the Alien: Covenant sequel and Disney isn't likely to let Ridley Scott make one once the Disney acquisition of Fox is finalized, it's hard to not wonder if this would have been better or worse. You can check out the full gallery of Prometheus 2 concept art over at AvP Galaxy. Will Blade Runner 2049 Be a Bigger Bomb Than Alien: Covenant?